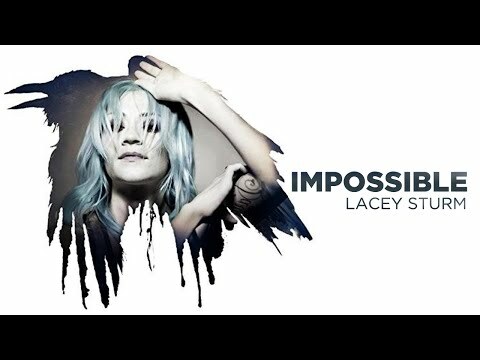 Lacey’s new song ‘Impossible’ is out now on iTunes! You can purchase the song by clicking here!! AMAZING! Definitely one of the best lyric videos I’ve ever seen, and I’m so excited they’re going with this song for the next single! Check it out guys. Flyleaf will be headlining the Snocore tour during February and March of 2015! For dates and cities, please look below. They are also offering exclusive VIP experience packages as well as the opportunity to get ON STAGE WITH FLYLEAF at every date! Buy your tickets today!! I decided to go on an expedition yesterday to find Lacey’s new book ‘The Reason: How I discovered A Life Worth Living‘. After making some phone calls to local bookstores, I managed to find it at Barnes & Noble a few towns over. When I brought it home, I ran upstairs, shooed my cats away because they were determined to sit on the book (as they often do with everything that gets between me and them), and opened it up. Before I even got to the first chapter, the tears started. And at several points throughout reading the book the tears returned. Happy tears, sad tears, smiling so big my face hurt, and involuntarily grimacing or pouting, wonder, awe…I went through the whole gamut of emotions. I read the entire book in one sitting, and was left with this huge heart of joy and fulfillment. And more importantly, a greater understanding of what it means to be a human being who loves God. Lacey has always had a gift for explaining the intricacies of the feelings, questions and thoughts that come with being someone who follows Christ. She used that gift to write a book. She has touched so many lives with her story, and now it’s something we can hold in our hands in written form, which I think is endlessly amazing. This book isn’t just for Flyleaf fans. Although it does explain her departure, and it gives insight to things that Flyleaf fans might be curious about; this book is more than that. It tells a beautiful story of a girl who was in the same painful place that we’ve all been in, and how she discovered a life worth living. Buy it — your life will be better because of it. I promise. This VIP Upgrade will include the following and will cost $50. You will still need to purchase a ticket to the show. Above you can view some videos of what your acoustic performance might be like! So grab some tickets and check out Flyleaf on tour!! 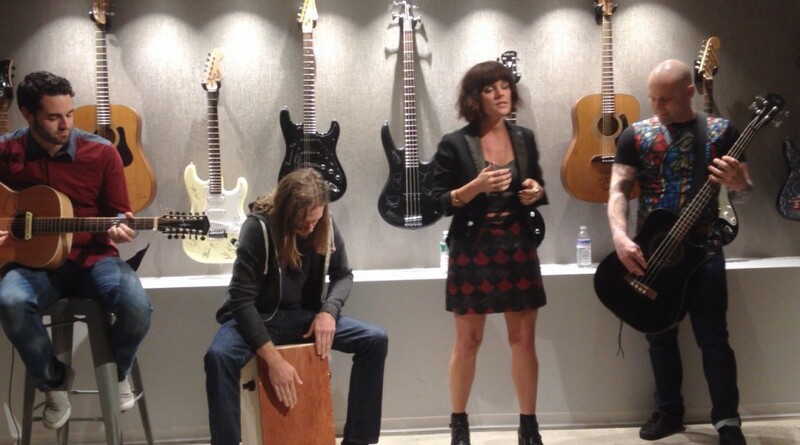 Check out Flyleaf playing Set Me On Fire acoustic HERE!! Flyleaf’s new album Between The Stars is available on iTunes, Amazon, and Google Play TODAY! Pre-order the book at these places! Check out the awesome write up on Billboard.com about Flyleaf’s new video for Set Me On Fire, and check out their amazing video above!! The beautiful artwork for Between the Stars has been revealed! Both the standard edition and special edition of the album are available for pre-order on Amazon, so if you haven’t pre-ordered, what are ya waiting for? You can also listen to 30 second samples of ALL of the songs. The whole record sounds absolutely incredible. So check it out! 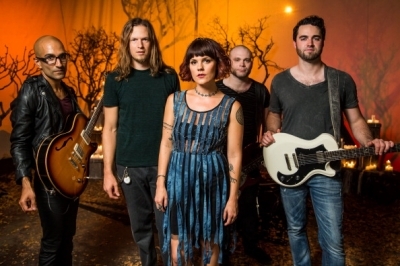 Rocknrollindustries interviewed Flyleaf on the set of their new video for Set Me On Fire. They get asked some questions about Pledge, their musical inspirations, what the video will be like and much more! So check it out! If you cannot afford it, but would like to own the song without illegally downloading it, I will gift the song via iTunes to the first 15 folks who spread the word about Set Me On Fire on their Facebook and Twitter. For those who do, email me at brittany@flyleafonline.com with the subject SET ME ON FIRE with a screencap of your post on your FB & Twitter. Make sure you also give me your iTunes email address! We wanted to invite our Flyleaf Family to join our BRAND NEW Street Team here: https://flyleaf.fancorps.com/ We are so excited to release our new record Between the Stars on September 16, 2014, and would love your help spreading the word about the album, and our new single Set Me On Fire! We’re offering some cool exclusives for those of you that want to help out, with more on the way soon! Hope you see you on the team! The deadline to vote is 5pm Central Tuesday. 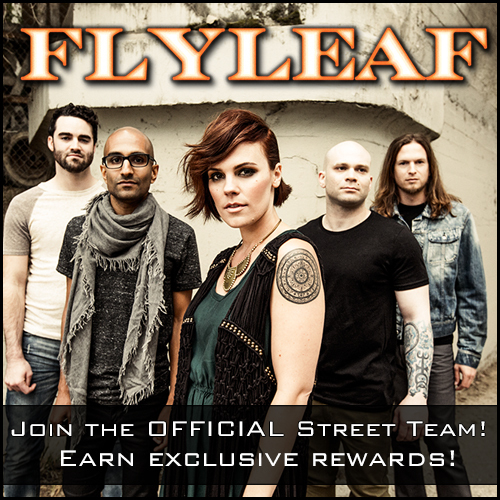 Let’s help Flyleaf win!! Check out 50+ photos from the Set Me On Fire set taken by Chelsea Lauren by clicking here. This video is going to be amazing! If you haven’t already, LISTEN TO THE AUDIO HERE!! 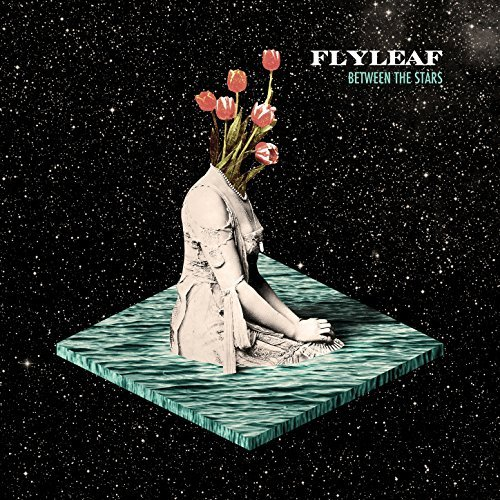 Hard-rock band Flyleaf will release their fourth album, ‘Between the Stars’–their first full-length with new lead vocalist Kristen May–on September 16 via Loud & Proud Records. 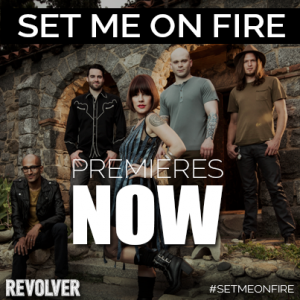 In anticipation, the band has teamed up with Revolver to premiere their new song, “Set Me on Fire.” Check it out below and let us know what you think in the comments! LISTEN TO SET ME ON FIRE HERE! NOW! DO IT! 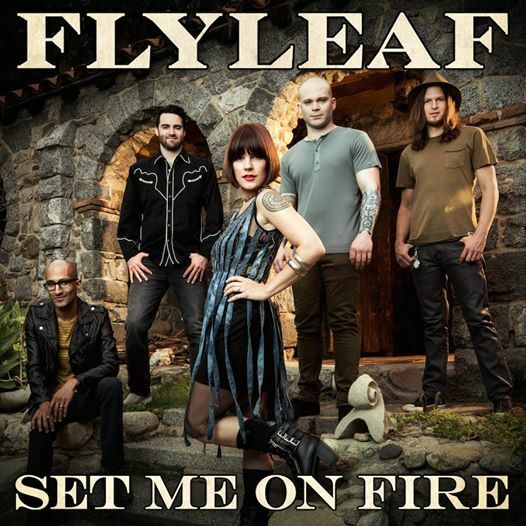 Set Me On Fire has been confirmed as the lead single from Flyleaf’s upcoming September 16th album release (this date has been regarded as tentative, but still, it’s exciting to have an idea of when we’ll hear it!). 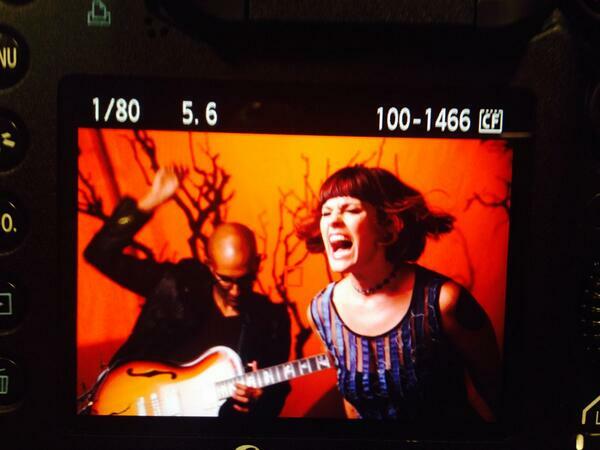 Flyleaf is shooting the video for Set Me On Fire in Los Angeles today! A still from the shoot can be seen above, and it looks really beautiful. Flyleaf has announced that the song will be released in July, so hopefully we will be hearing it very soon! If you haven’t pledged for the record yet, you can do so here! The pre-order option for the deluxe album release is going to be ending on July 15th, so make sure that if you want that exclusive, that you get to it soon! It’s going to have extra tracks, so it’ll be worth it to grab it. Flyleaf are getting a fresh start with their fourth studio album, having just announced they’ve signed to Loud & Proud Records to release the effort. 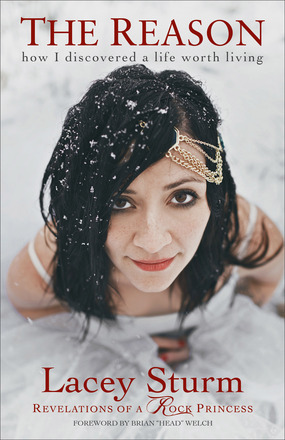 The band underwent a major change after issuing their 2012 disc, ‘New Horizons,’ as longtime vocalist Lacey Sturm left the group with Kristen May taking over as frontwoman. May had the chance to prove herself right out of the gate, as the transition took place pretty much coinciding with the release of the ‘New Horizons’ album. Also aiding in the transition was the band issuing a 2013 EP titled ‘Who We Are’ that allowed fans to get used to May as the band’s new vocalist. Flyleaf got a head start on the new record back in January when they started a Pledge Music campaign for the upcoming disc and by Feb. 2 the album was fully funded. The group has begun working on the disc with producer Don Gilmore and a number of song titles have already been revealed. Tracks include ‘Set Me on Fire,’ ‘Magnetic,’ ‘City Kids,’ ‘Marionette,’ ‘Thread’ and ‘Well of Lies.’ Fans can check out a live performance of ‘City Kids’ in the concert video below. Those wishing to pre-order the new album and find VIP packages for the group’s fall tour may do so by visiting the PledgeMusic site. 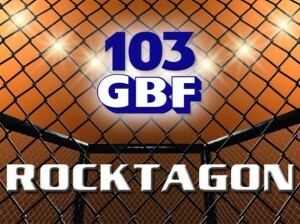 Look for the band to release their next single in July with dates for the fall tour being revealed soon.